Recognized for his birds, mammals and both his fresh and saltwater fish, Clark continues to create one-of-a-kind wood masterpieces for discriminating buyers throughout the country. Having had an interest in wildlife as long as he can remember, Clark Schreibeis (pronounced SHRY-bise) first carving was of a whale from a bar of soap at age 9. Unknown to him, this first crude attempt at sculpture would eventually lead to a career in wildlife art. After finishing school, Clark worked in construction and spent his spare time in Montana's wild places fishing, hunting and studying the wildlife that he loved. Clark's desire to pursue wildlife art as a career was inspired in 1980 during a four-month canoe trip on some of the wildest rivers above the Arctic Circle in Northwest Alaska. He and a friend floated, lined and portaged their canoe over 600 miles through the Brooks Range while fishing for char, salmon, and grayling as well as photographing caribou, moose, and grizzly bear. The awesome beauty of the fish and wildlife coupled with his lifelong love for the outdoors convinced Clark that he had to somehow carve out a career that revolved around the outdoors. Clark has spent hundreds of hours studying wildlife anatomy, color, habitat, as well as artistic composition and design. His first attempt at wood sculpture was a carved brown trout that won Best of Show at a taxidermy competition. A golden trout was his next subject which won Best of Show at the World Freshwater Fish Carving Championships in Traverse City, Michigan. Demonstrating his commitment to perfecting his artistic skills, he continues to win top honors at regional, national and world competitions. Clark, and his wife Erika, live outside of Billings, Montana and are blessed with three sons, a daughter and now 7 grandchildren as well. He owns and operates the Clark Schreibeis Wildlife Art Studio. He currently divides his time between sculpting, carving, painting, writing, judging, teaching and seeking out wild places whenever he can. In 1995, 1997, 1999, 2007 and 2013 Clark won "Best in World" Fish Carving at the World Fish Carving Championships making him the only carver to ever win three consecutive World Fish Carving Championships and Judge`s Choice Best of Show five times. In 2001 and again in 2004, Clark has been making his presence known in the competitive world of bird carving by earning the award "2nd in the World" twice at the World Bird Carving Championships in the Interpretive Division. 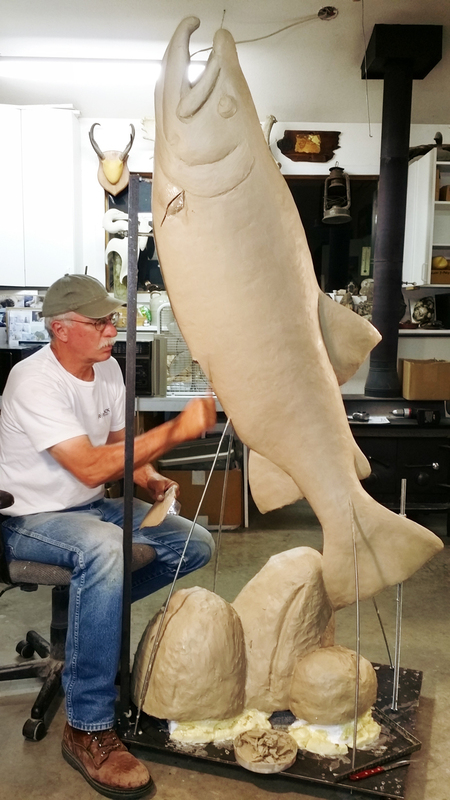 Master Carver, Clark Schreibeis, of Billings Montana produces some of the finest decorative (painted) fish, bird and wildlife carvings available. In addition, Clark has several limited edition wildlife bronze sculptures available. Recognized for his birds, mammals and both his fresh and saltwater fish, as well as natural finish (interpretive) sculptures, he continues to create one of a kind wood masterpieces for discriminating buyers throughout the country. Arts 2008 issue, Volume XV, No. 4, pages 76 ñ 80.